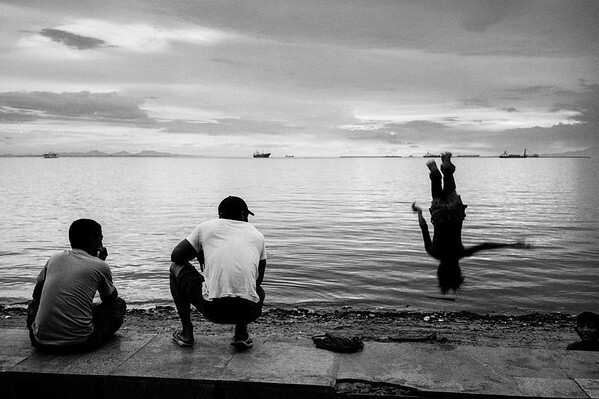 Images from Cambodia, Vietnam and Singapore. I wish I could remember the name of this ruin near Angkor Wat in Siem Reap, Cambodia. I think it might be Prasat Suor Prat, but I’m not sure. I took this image early in my photographic journey, during one of the first trips I ever embarked upon mainly to capture images. It was a great trip, and I came away with some pretty decent images, this one included. The entire complex of temples around Siem Reap is incredible. 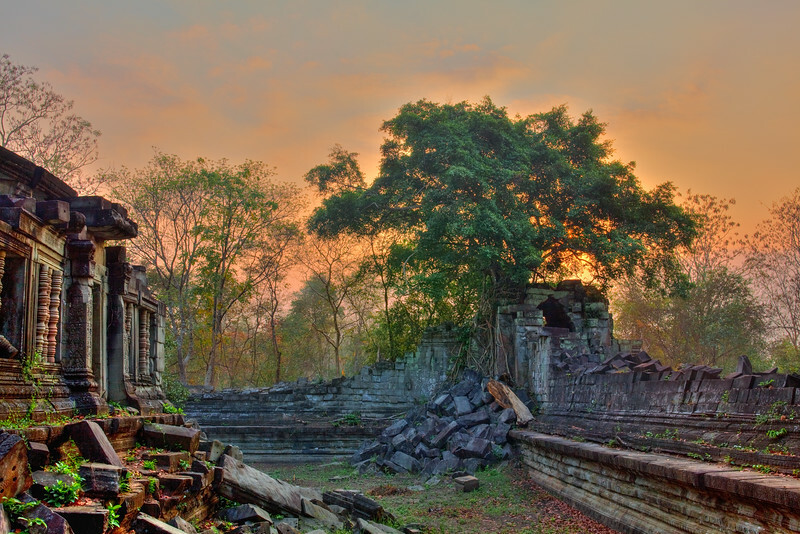 They, with the encroaching jungle attempting to reclaim land long ago cleared for the temples, are what comes to mind when one things of Indiana Jones and exploring Southeast Asia. This temple, if I remember correctly, stood alone from the others. I think that’s what drew me to it: fewer tourists exploring it, and its simple structure. 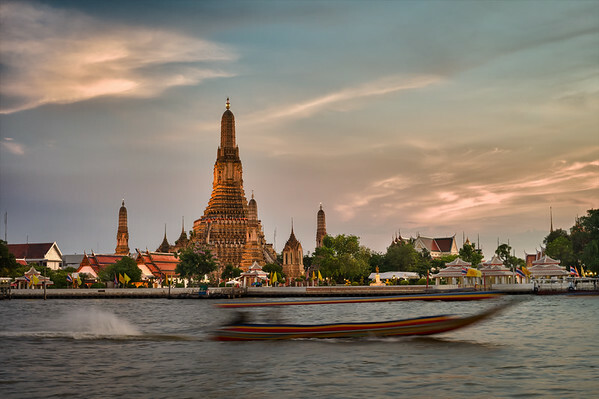 Located on the bank of the Chao Phraya River, Wat Arun is one of Bangkok's best known landmarks. 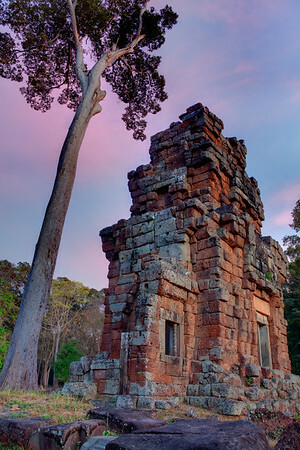 The Temple of the Dawn is a great place to watch the sunrise, as the rays will illuminate the tall central prang (Khemer-style tower). But, I had attempted to find a location that would allow me to shoot the sun setting near Wat Arun. Alas, my efforts were somewhat in vain, as the sun set a bit further to my right than anticipated, and I couldn't get the setting sun lined up with the prang. But, since I was already standing over the Chao Phraya on a rickety, probably long since condemned wooden dock, I made the most of my precarious position. I shot as the sun went down over the horizon and highlighted the whisps of clouds over the eastern part of the city. Then, when a speeding water taxi entered my frame, I captured the image. I think this is an accurate representation of Bangkok: an ancient culture in the middle of a modern and fast city. Angkor Wat is without a doubt the most photographed structure in Cambodia; and for good reason. It is a beautifully stunning piece of ancient architecture, built in the 12th Century it is a testament to the power and engineering skills of the Khmer empire of the time. 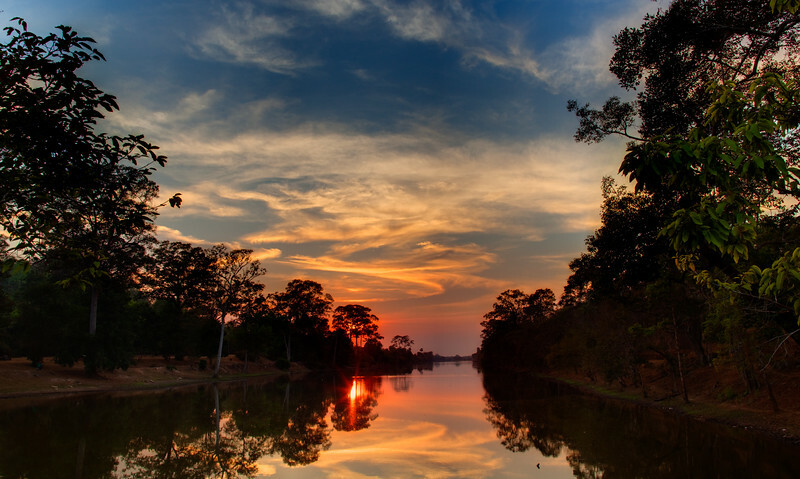 Most people focus their photography of Angkor Wat on the daily sunrise, which can be a beautiful site. I had my fair share of early more sunrise photography while in Siem Reap, but it was the more intimate interior pictures I captured throughout the day that left a lasting impression. One of those images is this window. 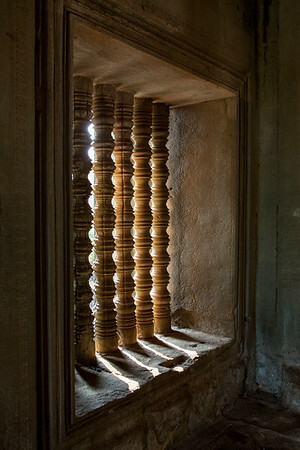 Ornately carved from stone, with the bright Southeast Asian sun streaming through the narrow pillars, this is one of Angkor Wat's exterior windows. What caught my eye with this scene, beyond the contrasting light created by the sun streaming through the window, was the ornate design and carving work that is shown on the windowsill and the wall surrounding the window. Even nine centuries later, having survived the onslaught of the jungle and annual rains, the detail is still exquisite. This image was taken early in my photographic journey. Now that I'm further along, I want to return to this location and explore it again. I hope to make that happen soon. 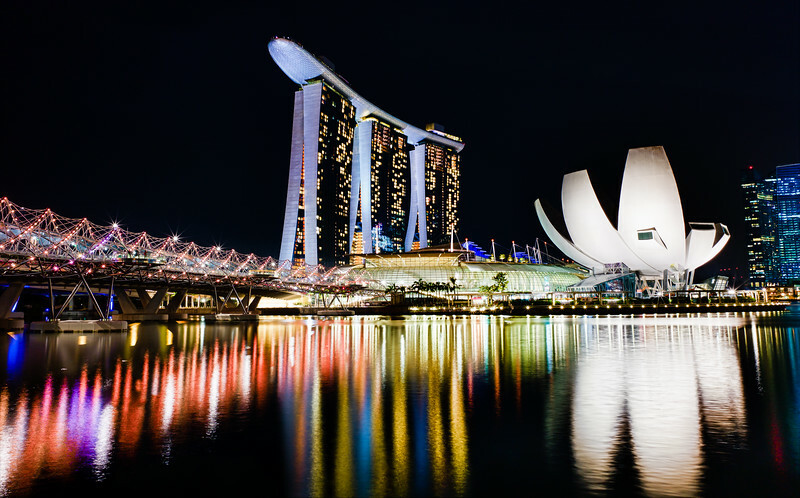 After shooting the laser light show and other landscape features around the Marina Bay Sands in Singapore, I stumbled across these two young women who were modeling for their friends. I watched for about 15 minutes, intrigued by what the photographers where having the models do. Finally, the photographers were talking amongst themselves, but the girls were still sriking up different poses. That's when I moved in quickly and captured this image. I was drawn the arms of the girl in front, and how they seem to indicate she wants to take off and fly away; she looks so peaceful in the image. I like to find the places where others tend not to congregate during peak photography times (e.g. sunrise and sunset). Sometimes it's inevitable that I'll end up surrounded by other photographers, but the goal is to get away from others and capture my own unique view of a scene. That's exactly what happened this evening at Angkor Thom. It seems everybody climbs up a specific hill to watch sunset; it might offer a great view, I don't know since I didn't go up there. As the crowds of people and line of tour buses worked their way up the hill, I set up my tripod on an ancient stone bridge, just outside the entrance to Angkor Thom. Over the next 45 minutes I watched as the sun and sky changed colors. as the clouds became irradiated with warmth, and as the reflections on the moat changed. The scene ended up being one of my favorite from the entire trip to Cambodia, and each time I see it I remind myself to follow my own path, not the herd. 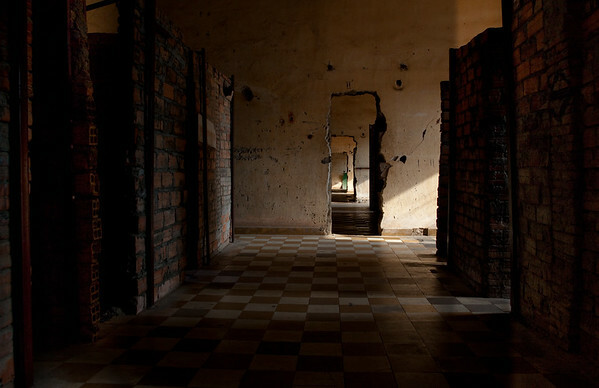 S-21 was a high school converted by the Khmer Rouge into a prison and interrogation center. It is estimated 17,000 people were imprisoned here over four years, most tortured and killed. Classrooms were converted into small, dark, windowless cells, where the prisoners were shackled to the walls or floor, and passageways were cut into the calls to connect adjoining classrooms, as can be seen in this image. Even more than 30 years later, the place feels haunted, with a heavy dose of despair hanging in the air. The texture of the brick cells, the concrete walls, and the ragged passageway showing room after room, all contribute to a sense of forboding. A sense of fear. A sense of despair. 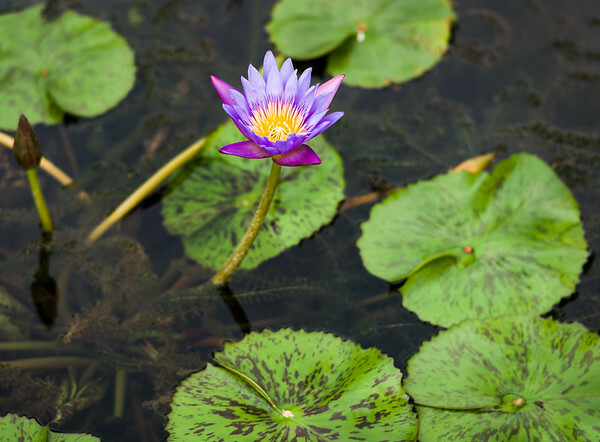 A small artificial pond sits outside Singapore's Science Museum in the Marina Bay Sands area, and that is where I cam across this perfectly beautiful purple water lily. I was struck by the greens and browns of the leaves floating on the water, and how the purples and yellow of the floor contrasted above the water. It looked so incredibly graceful and delicate.